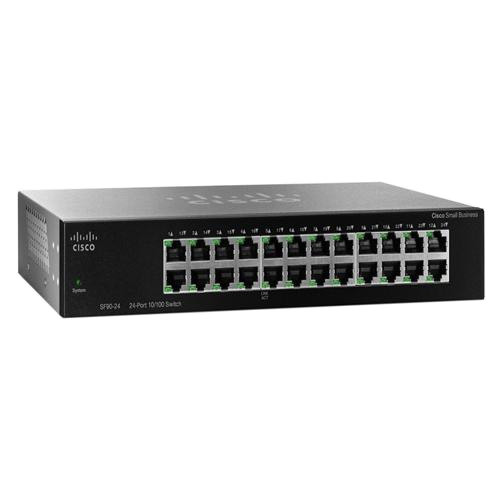 The Cisco SF90-24 24-Port 10/100 Switch is an unmanaged switch that has the speed, flexibility, and reliability growing businesses can count on. This easy-to-use switch works right out of the box, with no software to configure. Use this switch to connect up to 24 computers, printers, and wireless access points, as well as to share network resources such as servers and network-attached storage. Quality of service (QoS) enhances network performance and improves the quality of voice and video. The switch optimizes power efficiency and features Energy Efficient Ethernet, which reduces energy consumption without compromising performance. We hope that you are pleased with your purchase from www.umbermobiles.com However, we understand that there are occasions when you need to return goods to us. Goods Reported Faulty Within 7 Days of Receipt, Please report faulty goods within 7 days of receipt .When the goods are returned to us complete in its original packing, after inspection, we’ll issue a full refund to you via your original payment method less postage and packaging paid with the order. Goods Damaged in Transit If your goods were damaged in transit, we request that you report it to us within 7 days. If goods are visibly damaged on receipt, its best to sign the delivery note accordingly. Once the damaged goods have been collected and received back into our warehouse, we’ll issue a full refund to you via your original payment method less postage and packaging paid with the order. * Octroi charges shall be paid by the customer, If any. All prices are quoted in (Indian Rs.) Your order will be finalized when payment has been received and confirmed. We offer Credit/Debit Cards, Net Banking and Cash On Delivery available. very easy way to transfer Your payment .Your information is never stored on our site. © 2015 Sigma2020. All Rights Reserved.